Kikuyu is the English form of the proper name of the tribe, the Gikuyu. The name Akikuyu or Agikuyu with the prefix ‘A’ is usually used to describe the people as entities and ‘a Kikuyu’ and ‘a Mugikuyu’ for an individual being. To describe the language we say, in singular, “This Kikuyu is speaking Kikuyu or this Mugikuyu is speaking Gikuyu”. In the collective we say, “The Akikuyu speak Kikuyu or The Agikuyu speak Gikuyu”. When the definitive article “the” is used, “The Kikuyu tribe speak Kikuyu language or The Gikuyu people speak the Gikuyu language” is also correct. Throughout this site, I, Mukuyu, will always refer to the Gikuyu people as the Gikuyu and Gikuyu when reffering to the language and peoples. The context will usually give you a clear distinction as to whether it is the people or the language being refered to. Rarely will I, Mukuyu, use the term Agikuyu except when absolutely necessary. Never will I use the Englished term Kikuyu or Akikuyu except as a quote from some other source. 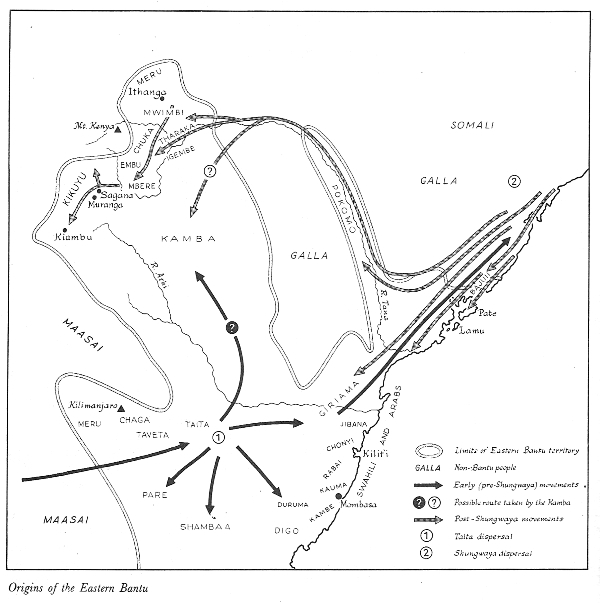 The Gikuyu origins are traced by historians as part of the greater Bantu peoples migrations in Africa,(see http://umanitoba.ca/faculties/arts/anthropology/courses/122/module2/bantu.html.) The best and most comprehensive is by Professor Godfrey Muriuki (A history of the Kikuyu 1500-1900 by Godfrey Muriuki)* Were, one of the foremost historians in Kenya admits that “The early history of the Kikuyu is still unknown”**, but goes on to posit that the Bantu migrated into the Mt. Kenya region in waves and not as a group from AD 1300. The Gikuyu seem to have been a grouping of such bands. A group certainly came from the South from the Taita region and is related more to the Kamba, Chaaga and Taita. (Were map) Other bands, that included the Meru, Embu and Mbeere migrated from the North in Ethiopia and others from the Central Africa. This would account for the various quite distinct facial characteristics among the Gikuyu. A round stocky soft face and the thin sharply defined cheek and forehead features being the main types. The intermarriages with the Maasai, the Kamba, and the original inhabitants of Gikuyuland, the short Gumba and the tall Dorobo and Athi complicated the gene pool even further. Today with the added gene pool from the British soldiers who participated in mass rapes of Gikuyu women in 1952-58, the picture is very complicated. For speculative purposes only I offer my opinion of observed main types for what it is worth. This is that the group that moved to Northern Kikuyuland, towards the sacred Mountain was the more spiritually inclined and was mainly from Ethiopian origins. The group that moved South towards the Coastal trade routes was the more enterprising and linked to the Kamba traders and trade routes to the Coast. Continuing studies in linguistics and modern methods in medicine like gene mapping, etc. (see http://med.stanford.edu/mcr/2008/Y-chromosome-0806.html ) may some day shed more light on the origin and complicated gene pool of the Gikuyu. This kind of complicated migration story is not the kind of narrative that can be handed down in oral tradition and as Amstrong observes, “Unless a historical event is mythologized, it cannot become a source of religious inspiration”*** It cannot endure and history without myth is cold and lifeless. It is even doubtful that history without myth can exist. The Gikuyu myth of origin like other myths of origin relates a garden of Eden scenario where God comes into the picture. According to this myth, the first man, Gikuyu walked with God, Ngai, Mwene Nyaga, Murungu, Mugai, or any number of other names given to Him. Call Him Ngai. The scene starts at the top of “The Mountain of God”, Kiri Nyaga generally called Mt Kenya. This is where God showed the first Gikuyu man the land below and instructed him to go to a specific spot to the South of the mountain where there was a grove of fig trees, Mikuyu. Gikuyu descended the mountain and on arrival at the place found a woman. I suppose he introduced himself and Gikuyu and Mumbi became husband and wife. He was also told that he could make contact with this Ngai at any time by praying to him while facing Mt. Kenya or by sacrificing a goat under the Mukuyu or another type of fig tree, the Mugumo. The name Gikuyu means a huge fig tree – Mukuyu, and Mumbi means Creator. The roots of the Mukuyu entered into the Great Mother Earth each nourishing the other and connecting with God. Man and the Goddess of Creation came together and as the milk essence from the Mukuyu entered the earth, the Gikuyu and the Mumbi brought forth the ten daughters who became the mothers of the ten Gikuyu clans. Think of the sun and moon and the ten planets. Gikuyu unlike Adam was not fashioned from mud but from the word. Mumbi was not created from Gikuyu’s rib like Eve but existed simultaneously if not before the man. There is no mention of sin, damnation and the messy start of lies, deception, murder, calumny and acrimony characteristic of the Bible’s Genesis and which are the main features of Western Christianity. Gikuyu and Mumbi were never cursed. 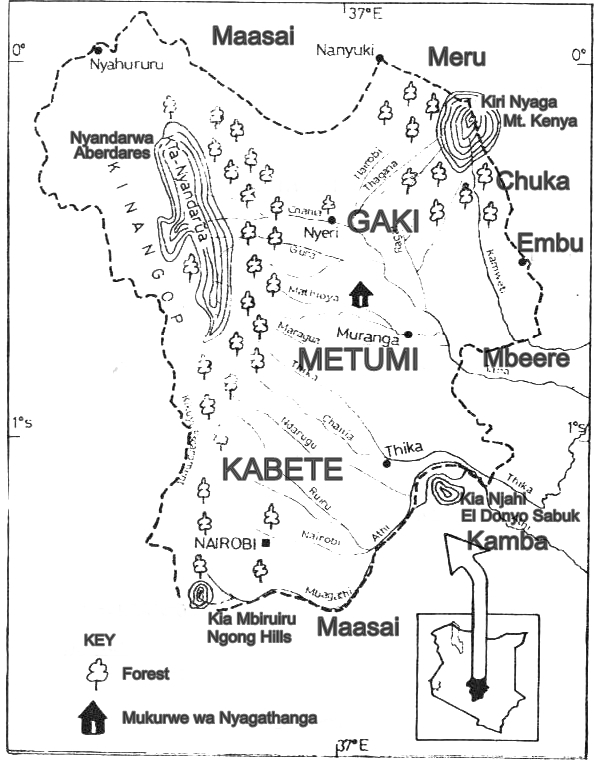 The original location of the Gikuyu Eden has been generally identified as being in Central Province near Gaturi village of Muranga District at a place called Mukurwe wa Nyagathanga. It is believed by the Gikuyu to be the cradle of the tribe. The map below taken from Google Earth shows that you will take the Muranga – Othaya road to Nyeri and branch off right at a market town called Karuri. It seems like myth has always had a greater attraction and meaning to humans than so-called facts and most Gikuyu seem to take this creation myth very literally as actual occurrences beyond question. They would cling to the myth even if scientists were to definitively “prove” through gene mapping and so forth that the Gikuyu originated in Egypt from a group of slaves in Egypt who fled the Pharoah to the South as another the Hebrews led by Moses fled North. What seems certain is that moving bands of migrating Bantu groups dispersed from several nodal points notably Central Africa, Ethiopia, South Africa at various times. What the Gikuyu may have retained in their collective memory is such a point of dispersal which they give the name Mukurwe wa Nyagathanga, a sort of Garden of Eden for them. Let us try to locate it. Like many garden of Eden’s there was a tree of Origin involved, in fact for the Gikuyu three important trees. The tree of origin for the Gikuyu is the Mukuyu, (Ficus sycomorus), a fig tree with a nice, beautiful and evergreen shade which provides a wonderful shadow as a sanctuary from the African sun. Since these trees grow to a great age and height an old one can be called a gikuyu. From high up in the mountain looking down they are landmarks or nodes in the landscape.It is to a groove of these trees that Gikuyu was pointed to by Ngai from Mt. Kenya and to where Gikuyu went to establish his first homestead and from which he got his name, Gikuyu. The picture on the right shows a gikuyu being used by the Gikuyu as “Axis Mundi”, “Tree of Life”, or “Origin” in a music ceremony the “Gicukia” photographed here by Father Cagnolo at around 1910. The ashes from its branches is super white and mixed with fat made the white paste dancers painted their bodies with. This paste was called ira exactly the name given to Ngai’s white snow on top of Mt Kenya. All major Gikuyu religious sacrifices were done under this tree and the name of the tribe Gikuyu is derived from it. The site of the first homestead according to myth was called Mukurwe wa Nyagathanga in Muranga. The Mukurwe (Albizia gummifera), was a common tree found in most parts of Gikuyu land and had a variety of uses. Its trunk was used for building, the branches for firewood and leaves are also feed for goats. The mukurwe was a utilitarian tree where the mukuyu and the mugumo were sacred. The Nyagathanga bird made its nest at this particular tree and hence the name Mukurwe wa Nyagathanga, the Mukurwe belonging to the Nyagathanga bird. Mukurwe wa Nyagathanga as a site was the habitation of Nature long before the appearance of man and woman and the idea that a site can be demarcated and owned. I would like here to speculate that the practical needs for the establishment of a homestead like, availability of water, fuel, building materials could have been just as important in the choice of place as those of religious meaning, if not more important. The name for Gikuyu’s companion Mumbi, means Creator which means she fashioned things from clay and as a potter she would also have needed a place with good clay just as Gikuyu would have needed lots of building materials. It seems like the place would have had to have the following characteristics. In the immediate vicinity of a huge fig tree, mukuyu or Gikuyu, around which the daily activities of the homestead were centered. This tree could also have been the locator of the place from afar. It gave the tribe its name, Gikuyu. Near or surrounded by lesser trees like mukurwe, muringa, muhu and other utilitarian trees suitable for firewood, building materials, animal feed etc. In the neighbourhood of a mugumo, the sacrificial tree and certainly not next to it. Near a source of drinking water, Gathambara. In a fertile place ready for agricultural exploitation. Near a source of good clay useful for pottery. Are all these present at Mukurwe wa Nyagathanga? The answer unsurprisingly is that in all Kikuyuland it is the one place with the a good if not the best, combination of all the above. Mukurwe wa Nyagathanga means, “The tree where the Nyagathanga bird dwelleth”. The bird preceded the woman and they have a special relationship and bond. The woman preceded the man and was at Mukurwe wa Nyagathanga first. And finally, it may well be that the place only existed as a metaphor and was never meant to be a physical locale. This would bring it at par with other mythical places of origin like the Garden of Eden and others fantastic places like Eldorado and Shangri-la. These places and such ideas and beliefs in the existence of a Holy Grail, a Golden Fleece, a Philosopher’s Stone etc. are vitally important in their contribution to a people’s search for wholeness and are embedded in human psyche. In conclusion, this post has opened discussion on several questions on the ideas of “Location” or “Place” of Mukurwe wa Nyagathanga in Gikuyu consciousness. Like the spiral of the Gikuyu basket, kiondo, we have to follow the string backwards through all the stages, till we arrive at the naval, mukonyo. The search for the original location of Mukurwe wa Nyagathanga may have only began. We shall not cease from exploration, and the end of our exploring will be to arrive where we started and know the place for the first time. * Muriuki, Godfrey. 1974. A history of the Kikuyu 1500-1900. Nairobi, Oxford University Press. ** Were, Gideon S., and Derek A. Wilson. 1985. East Africa through a thousand years: a history of the years AD 1000 to the present day. London: Evans Brothers. *** Armstrong, Karen. 2005. A short history of myth. Edinburgh: Canongate. **** Wanjau, Gakaara wa, 1999. Warahuri wa Muhooere wa Gikuyu na Mumbi. Karatina: Gakaara Press Ltd.
***** Beech, Mervyn W. H. 1913. “3. The Sacred Fig-Tree of the A-Kikuyu of East Africa“. Man. 13: 4-6. Post updated to accommodate Gikuyu cultural icon, Gakaara wa Wanjau’s views on 19th September 2009 . Dont you think Mukurwe wa nyagathanga should be a tourist attraction site? Nyagathanga is a bird? I would be very much interested to know that bird (if at all it does exist) – do you know of where I can get a photo or a video of that bird? The word ‘nyaga’ in nyaga-thanga may lead us to somewhere. We find “nyaga” in the word ‘kirinyanga’, and “ngai mwene nyaga”, as well as in the ostrich itself. Nyaga is a common name in kikuyu, embu, meru and tharaka. I have heard it in embu that Nyagathanga just mean nyaga na nthanga, a man and his wife who migrated from embu (read ndia or gichungu) and settled in nyeri. Any ideas? Yes. Nyagathanga is a bird and I tend to agree with Warigia Mahinda that it could have been the source of the name Mukurwe wa Nyagathanga. Fred K Kago has a list of 49 traditional Gikuyu birds in his small book, “Wirute Guthoma – Ibuku ria Keri” which includes Ndutura, Karũgũrũ, Nyamĩndigi, Kamakia arũme, Ndundu, Thũriũ, Gathũngũrũrũ, Nyagathanga among others. I have no claim to know the bird but will keep that in mind. As for a picture, also no. Get the book from Bookpoint, Moi avenue, Nairobi. Its worth it. this kind of discussion should not be brought to characters bent on distortion… I hate to say that most of women… but not all should not be taken serious bearing in mind that… most of their contributions are made with a ‘ fear of what others will think of me since I want to look good ‘. this includes ‘sissies’ who pose as men… but deep inside fret when they realise’. ‘l might be seen as too Kikuyu’… hehehe…. if it doesn’t touch on others… please let no be allowed to distort and spoil a good debate as this one. Thank you for answering that question. Now we can comfortably say we have a bird called ‘nyagathanga’. When you get its image please post it here in your blog. It might be interesting to compare the appearance of that bird, the ostrich and the snow peak of mountain Kenya. It may not be a coincidence that the name ‘nyaga’ is appearing in all the three mentioned. To name that bird nyaga-thaga, the kikuyu must have used a certain criteria, and that same creteria may as well have applied in naming of the ostrich bird or the god ‘mwene nyaga’. Borrowing from Giriama people (read mijikenda who are Bantu closely related to central Kenya Bantu), the word kidhumbiri (thumbi in kikuyu) is a crown/head-dress of WHITE OSTRICH TAIL FEATHERS given to an elder chosen for wisdom and uprightness. It is my opinion that the use of the word ‘nyagathaga’ in this scenario is that ‘nyagathaga’ is a blind folded code for the centre of real power for the kikuyu people. Wandia you are amazing. I have been stumbling over so many codes and hidden meanings with the Gikuyu. Thanks for your insight. I am visiting this site for the first time now, and this may have been discussed elsewhere already. I have heard the story of Mukurwe wa Nyagathanga from a different perspective. That the site had a Mukurwe tree and there was a bird called Nyagathnga in Gikuyu that used to live there. The place was therefore called Mukurwe wa Nyagathanga, and this is where Gikuyu and Mumbi settled first. But all the other features mentioned are there – including a small river called Gathambara. But i think gikuyu didnt come from mukurwe wa nyagathanga as the writer states, this is because even the origin of the name muranga where the place is located, comes from what kikuyu people from kirinyaga and end embu used to say ‘TWATHIE KURANG’A’ meaning we are going for a visit, so how could people visit where they originated? Unless a group of kikuyu moved in the area in a different wave! Most likely not possible. May be its a carry over of ancient memories of creationism, the myth has also alot of astrology eg nine daugters=nine planets, a man= sun god, woman=moon, compare with otehr myths n u will find alot of simiralities, even Mt Kenya could have been sacred because of its amazing size and huge avalanches that occur in glaciated areas, may be they thought of avalanches as someone who restricted movements by dropping huge pieces of ice, think of it. this is a very informative website. i have learnt a lot about our culture. Nyagathanga is actually a bird. It is normally called Kanyagathanga or simply Nyagathanga. it is a mall bird, smaller than a dove. unexpectedly, it does not have a white patch, as name may surgest to mean a “nyaga“ in ostrich or the white patch on Mt Kenya. its English name is Sreaky Seed Eater. you can google that name to see the pictures. My fiance is a Gikuyu woman, so naturally I’ve taken a keen interest in her families culture. Your site and posts have proven to be an invaluable and extremely informative source for me. Thank you so much. I think mukurwe means the valley where kikuyu members of families were brought up, and nyaga means the wonderful bird created by ngai, a wonderful creation from God Himselfe represent all things and animals and birds created by ngai thats why in ceremonies kikuyu use ostrich feathers in most occation! Thanks for this informative genre of where we came from.i agree with dispersion of kikuyu .however i would like to know of any language trace of the kikuyu from Ethiopia route.im fluent in lingala of congo and its 75%kikuyu in only change in meaning in some words or pronouncing. Even deep kikuyu words like ndaru.delo.kobora.kopola,kugitira kobatela,munene.monene are in lingala.other we pronunce same but meaning change eg kolinga,mosala,kotelema,komema kikuyu kuringa,mucara,guterema.kumema really shows we were together more thsn many bantu.not forgetting mandalala which is kikuyu matharara and they use it exactly like kukuyus.please let mi know of any trace in language similarities the ethiopia route. Am thrilled by such a rich history coz when i though about the meaning of our tribe i never thought of a Mukuyu tree despite that it was a very common name by old people when i was growing. God bless the writer and help him to educate us more about our origin and culture.